Following on from the #YOYP Equality Collective Planning Meeting, we are holding an information and consultation event for young people to work together and shape a space for ALL young people to be themselves. The space would allow young people to get advice, support and guidance about the things that matter to them without fear of stigma. 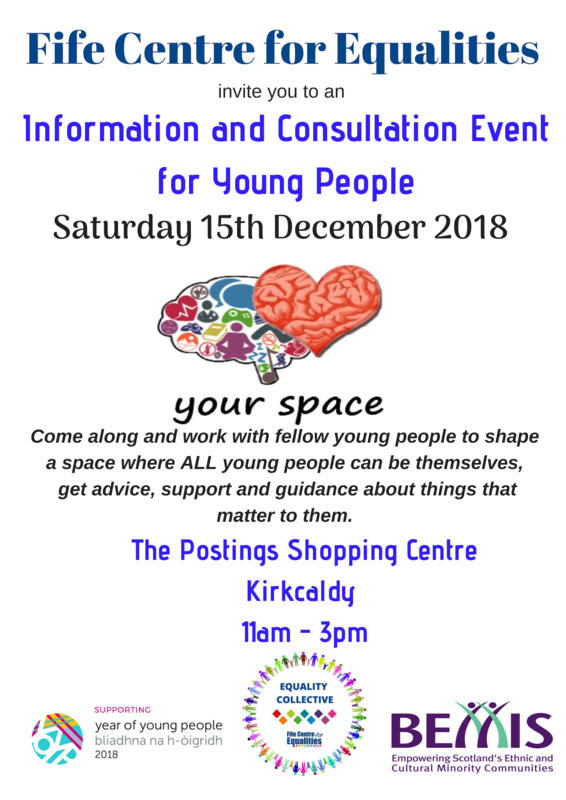 This event will be taking place on Sat 15 Dec 2018, at the Postings Centre Kirkcaldy, Hunter Street, KY1 1HN from 11:00 to 15:00. Funded by BEMIS Scotland via the Year of Young People 2018. This is a partnership between BEMIS Scotland and the Scottish Government to facilitate diverse, multicultural celebrations.